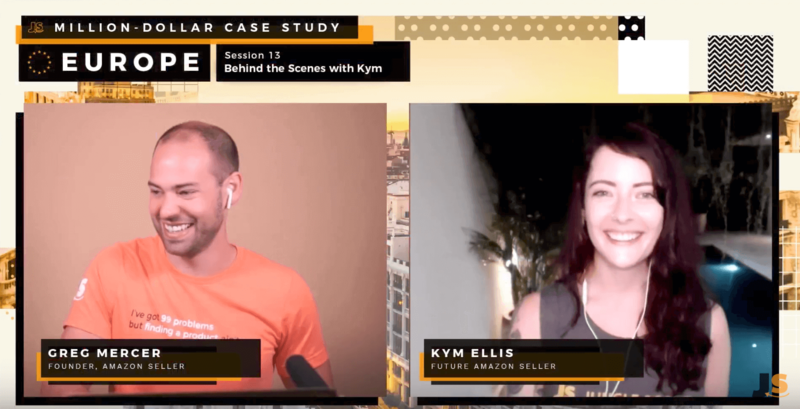 In this session we decided to take stock of progress so far, as well as dive into all of the things I have learnt on my journey to becoming an Amazon seller, and the things I wished I knew before I started this process. Coming up are lots of updates about the progress of my sleeping bag shipment, before diving into an honest interview with Greg, where he asks me questions about what I have enjoyed, found difficult and how becoming an Amazon seller has fitted into my life. If you are following along, you no doubt have had your own experiences and we’d love to hear all about that in the comments. Importantly, make sure you take the time to stop and take stock of how far you have come since beginning with the all important product research. Launching a product on Amazon is exciting, but it can also be frustrating at times. It’s a good idea to take a step back and congratulate yourself for all of the progress you have made, and keep that ambition and momentum going. Just in case you were wondering, we are using Fetcher to keep track of all of the important metrics like sales and profits. But we will cover in more detail later on in the case study how to manage your business analytics as an international seller. I have been getting frequent updates from the supplier and we speak almost every day and ask each other questions along the way. There are several things she and I have had to discuss, such as shipping a sample for photography, air freighting the first few cartons, labels and shipping marks and so on. Overall though I am very happy with this supplier, the products are looking great so far and communication is fantastic. I took the time to let them know that I was very happy – remember, I am trying to build a strong long-term business partnership here. When asking for updates from the supplier, they were able to send me lots of photos of a production test run they did. This is a really good opportunity for me to see how things are looking and spot any last minute adjustments or tweaks that we may not have already caught. I think it’s looking great! The high quality ripstop outer fabric is what is giving it shine in this image, which was a free upgrade I managed to negotiate. 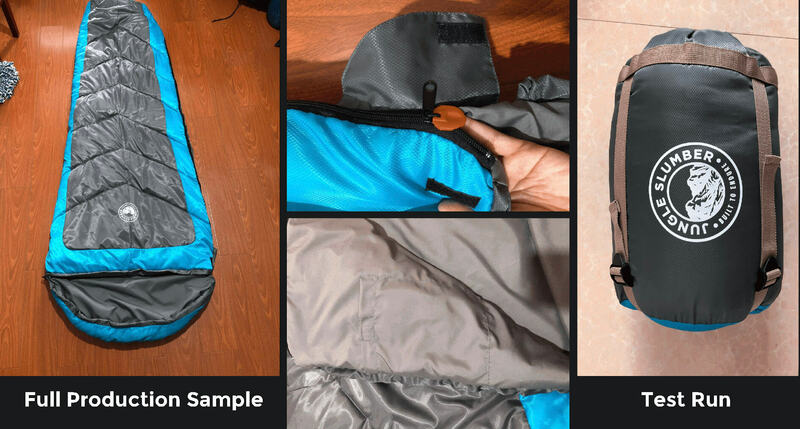 You can also see in the internal pocket and the snag free zipper. The outer case looks great too, with the stronger compression straps as required. When I say this is a good time to spot anything that needs changing, this is precisely what happened at this point. The logo has a slogan of ‘built to endure’, and when we investigated this, we found there was a trademark for this slogan by another outdoor company in the US. Red alert! Luckily for me, I managed to catch this just in time and the supplier was happy to receive an updated logo before production had begun. Huge sigh of relief. The lesson to learn here is that you need to check for intellectual property infringements for all slogans and other word marks you want to use, not just your brand name. We shared this previously but in order to keep this update complete, here’s what the final branding and labels look like for the product. To the left is the label that will be printed and stuck to the outer packaging (a strong poly bag), and which will show the FNSKU in the bottom right corner. The two labels two the right are the insert, which will be a double sided card swing ticket attached to the compression case of the sleeping bag. Again I am really pleased with how these came out (not the updated logo). On all of these printed labels the aim is to instill the quality and value of the product, and the insert serves to set the scene for getting a review on Amazon from customers. I will also follow up on this with some email campaigns which we will cover in a later session after the launch. Many of you have questions about the pricing and profit calculations, so I just wanted to share how things progressed on this front and some of the lessons I picked up. If you have been following along, you will know that I did pricing calculations way back in Session #3. 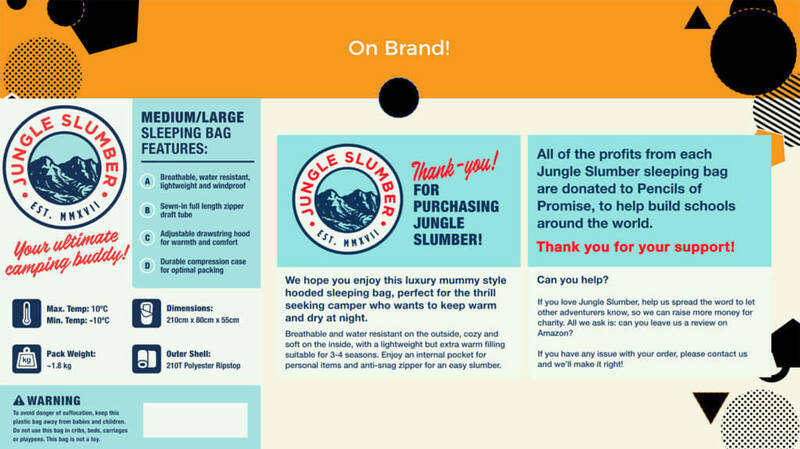 This was based on my initial outreach to suppliers and the average quotes I was being given to manufacture sleeping bags to my specification. Since then, and once I started having more detailed conversations with suppliers, the prices did go up. Although I gave a comprehensive product specification to begin with, many suppliers sent me a basic quote which did not cover the finer details. Once I started to have these deeper conversations I got more realistic prices, which were negotiated, and then revisited the profit calculations. What I learnt here is that in order to get an accurate quote from suppliers, you probably need to dig deeper than the responses you get from your initial outreach. Of course this takes time, and if you get this far and find that you are struggling to get a good supplier and good prices, it may even be time to go back to another product idea. Go with quality and a high end product – many experienced sellers want to sell higher ticket items in order to grow their business. I don’t want to be stuck in a race to the bottom with a product that has minimal features, or worse, risk getting poor reviews. Select the best supplier in terms of quality even though the price was slightly higher, and negotiate a good deal with extra features (like ripstop fabric). Accept a lower profit margin than initially calculated, and plan to expand the product internationally (maybe to the US and Germany) to gain more profits by selling more units. So what’s next? Well the product sample for photography is now ready and I have spoken to and briefed a photographer in the UK who is going to handle both my product and lifestyle images for me. If you missed our session on photography tips check it out here. I have been informed that there will be 150 cartons of sleeping bags, and I intend to ship 30 cartons by air as soon as they are ready to get them into the warehouse sooner. The rest will be shipped by sea. In the meantime, I need to ensure the product listing is ready along with the photography in preparation from launch. At that point, we will cover all of the launch strategies used in this case study! If you haven’t found the winning product you’d like to launch yet, The Chrome Extension is a great place to start. Next up in this session, Greg interviewed me about my experiences so far and what I have learnt. If you missed this session I would advise giving it a listen in the video at the start of the post from 11:55. Here I will just summarize some of the key points that were made. How did you feel going into product research? I went into this experience with a positive approach and was excited to see what products I would be able to unearth and find to sell in Europe. I already knew that this step was important (I do have a great mentor!) and that there is a lot of time to put in upfront which gets easier as you go. For many the hardest part at this point will probably be managing this time effectively. I would advise to put aside 30 to 40 hours of time for research alone, depending on your methodology and whether you have tools to help speed the process up a little. Takeaway: Find a good system of setting aside a set number of hours in the evenings on certain days of the week to break up the tasks, whilst maintaining a strong ethos of keeping all of your research logged in a spreadsheet. I was surprised to find that finding a supplier and building my first supplier relationship was the most enjoyable part. It can be quite daunting if you have never worked with suppliers in China before, and this is probably why I found it rewarding. It’s gone pretty well so far and I enjoyed this more than I thought I would which was a nice bonus. Other areas I know I enjoy and have a stronger skillset in are product branding, photography and listing copywriting. Amazon sellers come from all walks of life and will each have their own favorite and least favorite parts of sourcing and selling products. Let us know what yours are in the comments! Takeaway: Greg mentioned that a lot of sellers find it daunting when working with businesses in China for the first time and I felt it was easy to feel like a “fraud”, but there is really no need to. Even when you are just starting out, try to have the confidence that you building a business. It doesn’t matter that you haven’t launched a product yet, if you have the confidence, and the right approach, suppliers in China will treat you just the same. What have been the struggles? I knew before I started that pricing negotiations wouldn’t be my strong point. I relied on Greg and my peers more for support on this. In the end it worked out fine, and I definitely took away some lessons for next time. It’s also useful to acknowledge that sometimes this journey can be a little frustrating. It takes time, and you want to ensure you do it right and launch with the right product and have everything in order as much as you can. Takeaway: Remind yourself that progress is still progress. Even if you step into a few roadblocks or difficulties that you have to overcome, all of this is good progress overall in getting towards that first launch. How do you communicate with suppliers? I communicate most days with my supplier via Skype messenger. We have spoken on the phone a few times. For us this works great, because we’re both used to communicating via instant messaging. It may work better for some people to have frequent calls instead but this works for me. I always speak in English to the supplier. Timezones are not a problem so long as you plan, even if you are in a completely opposite timezone to China, make effort to know when your suppliers come online and when you can catch a little overlap for 30 minutes or an hour each day. I found that my supplier will often come back online in the evenings too. You can also set some expectations with each other so that you know what to expect, and when to expect a response. Takeaway: Find a system that works for both you and the representative at the factory and ensure you both know what to expect from each other. How do you find travelling and launching a product? Greg wanted to know more about if I ran into any difficulties when I became a digital nomad and left the UK to start travelling. I actually started the product research in the UK, before moving on to Budapest, Vancouver, Hong Kong and now Bali. So far so good, it hasn’t impacted the progress in any way and it’s definitely one of the perks of launching an Amazon business. It’s pretty awesome that I can still speak to my supplier every day, ship my inventory to the UK and start making sales no matter where in the world I am. We used the Web App for our product research, and to keep track of potential products. It’s also a great place to start if you are trying to find a niche to sell in! All it requires is a little forward planning so you know what routine an timezone you will be in. Takeaway: If you want to travel, being an ecommerce entrepreneur is a great way to do it. There are also lots of people following in similar footsteps in many digital nomad hotspots around the world, especially in Southeast Asia, so it’s really easy to meet likeminded people. That being said, if travelling constantly is not for you, then you can also find great Amazon communities online and of course launch a successful business from any location where you live. How did you overcome understanding VAT to sell in Europe? I was no VAT expert before we started, despite being from the UK. I learnt pretty much everything I know about VAT for Amazon sellers from our guest Christoph, back in Session #6. It’s worth it to hire a professional to ensure you collect and pay VAT correctly – unless you enjoy accountancy it’s going to free up your time exponentially and ensure you don’t pay your taxes incorrectly. VAT is included in the retail price in Europe, so in the UK if I sell a product for £27, 20% of that will be VAT. I need to collect this VAT and pay it back to the authorities. You will also need to get an EORI number to import your goods, and pay import VAT which will act as a deposit, and be deducted from your final tax bill. Takeaway: Ultimately, running a business of any nature has these same requirements and it’s just something that you need to be aware of as an Amazon seller. If you understand the basics and hire an accountant to help you manage your taxes, you’re covered. How do you find answers when you get stuck? The first port of call is always some smart searching in the search engines. We have lots of content on the JS blog, and there’s tons of content out there in general. Outside of that, there are so many communities online and in person that you can join and become a part of. For example, our Facebook group FBA competitive edge has over 36 thousand members and there’s plenty of others out there. You can also try and meet people at local coworking spaces, events and meetups. Takeaway: The Amazon community is great at sharing and especially at helping out those who find themselves stuck, make sure you utilize this and then give back to the community when you are able to help others. How did you navigate shipping? Again this was a new area for me to dive into and it sounded complicated and scary from the outside. But the truth of the matter is that it’s not that difficult, and the trickier parts are handled by your freight forwarder for all ocean freight. The main thing that you need to remember to do is form a relationship with a good freight forwarder, who will become one of your trusted suppliers of this service for time to come. Make sure you go back to Session #9 for more information. For my products my supplier is sending the shipment FOB to the port in China, at which point the freight forwarder will handle shipping, customs, unloading and getting the cartons all the way to the fulfillment center in the UK. If they have any questions or need anything from me or the supplier, they will ask, and if I don’t understand what it is, they will guide me through it. Takeaway: Don’t be scared of international freight and customs or let this hold you back. It’s much easier that it seems. Are you going to sell in the Pan EU program? This is something that I need to learn more about, and therefore in an attempt to walk before I can run, I am focussing on launching in the UK first and foremost. As mentioned, in order to increase sales and profits for this case study, I will then look into importing into the US and perhaps across Europe. All of this will of course be documented as part of this case study. As far as I am aware, the Pan-EU program has been put together to help sellers expand into these up and coming marketplaces, by sending your inventory to Amazon and having them fulfill across Europe. It doesn’t come without extra considerations, though, such as VAT and language translations. Takeaway: If you are expanding internationally for the first time, be tactical and don’t bite off more than you can chew. Try launching in a single marketplace and ironing out all of the details of your product first, then scale and grow from there. Phew! We covered a lot of topics in there. 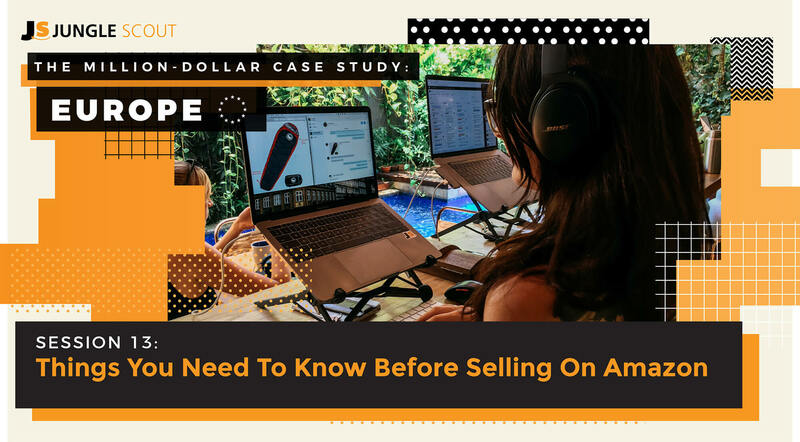 Hopefully that was a transparent insight into some of the learning curves of becoming a seller, and how to overcome them. Drop into the comments below to share some of your own experiences, or ask any burning questions you might have if you are just getting started. In the next session we cover how you can manage international Amazon payments. When you are selling internationally, this means being paid by Amazon in different currencies. Make sure you check out this session with our guest from Payoneer, to find out how you can dodge huge currency conversion charges! I’m curious about the suffocation warning–do you need to have it printed on the sticker? Why not have the factory print the suffocation warning right on the bag, and save the sticker entirely for brand-related things? Also, you’ve left a blank space for the fnsku code, but at what point do you actually have the fnsku code printed on it? This is just how we/our supplier packaged the product 🙂 Ultimately it’s up to you to provide designs and a brief to your supplier. I always find it useful to ensure all packaging requirements are covered early on to avoid nasty extra fees later. Sometimes you end up having to stick a last minute label on if things get forgotten! Ideally we would send the label design complete with the FNSKU – if for what ever reason this is not available then we just stick it on top later. I really appreciate what you are doing ! That was just a guesstimate as to how much it would cost per KG so that we could do some calculations. At the time I didn’t know the final weight of the product. It ended up being 1.4kg for the small size and 1.6kg for the large size, because I went for a high-end lightweight product. It would definitely be better if you had accurate measurements for these calculations – otherwise you have to allow for some leeway for your costs. Even better, if you know the dimensions and weight of your inventory, you could go ahead and get a quote from your freight forwarder at this stage so that you have a clearer idea of price, as time of year can also affect shipping rates. I saw you guys budgeted only 1,35 pound (5%) for Amazon PPC. Isn’t it too low? Do you have an idea of the cost per click yet? Or did you actually plan a higher ppc cost per product in the first few months to eventually lower it down to 5% once your listing is ranked? It is quite conservative for the launch period, especially for us, as we launch publicly we often have to be a little more aggressive with the launch. But having said that, most sellers will likely need to set a realistic budget for PPC and this is just a guide. From experience you can definitely expect to pay a little more to begin with, and then optimize like crazy and get your campaigns running like a well-oiled machine. Don’t forget that you can set your maximum bid, so you only need to go as high as you are comfortable with. Just a quick question on your pricing. I noticed that the referral fees were not subtracted from the net profit, is that correct? The referral fees by amazon need to be subtracted from there too, right?